Happy Monday! Did it snow this weekend for you? I came out of my post call cave Saturday to beautiful falling flakes that landed on my eyelashes and made me smile. And I don’t even consider myself a winter person! Still, it was nice to see the snow softly falling, and I hope your weekend was cozy and warm. There is not much to say on this January day, other than that life has been pretty regular but I like it that way. But! At the end of the month it will be much more wild, with my momma and sisters coming up to Chicago to help me try on some beyoootiful wedding dresses! (!!!) I am so excited to see my sweet family and go do something so very special with them. To make sure I am not one of those crazy brides, I did go to a small salon the other day with a few of my boss girlfriends to figure out the lingo - oh my, yes I learned so much! About mermaids and fit-and-flares and sheath dresses, about bodices and gathered skirts and blushers… so much! But also I figured out a little bit more about my style, lace vs beads, strapless vs spaghetti straps vs regular straps (so. many. options) - the designer went through it all step by step and put me in all sorts of gorgeous numbers and for that I am SO THANKFUL. Hopefully it’s all a meaningful, wonderful start to the beginnings of the #tinyasianwedding planning! Hooray! January also always brings me back to the beginnings of this blog, when all I had was a point and shoot digital camera and Wordpress without any real sense of where the blog was going to go. And now here we are four years later, and did not imagine that it would still be a meaningful part of my life. But it has become much more than a place to share my baking adventures. Each year it feels more and more like my life journal, as I figure out myself in my twenties in all sorts of way - my career, my emotions, and my relationships. I look back on my life adventures, big or small, joyfully and conscientiously, trying to learn from each moment and savoring what a crazy ride life has been these past four years. I will always be an ice cream gal. I mean, if you give me a donut I would eat it happily. Cake is great, the best part is the frosting. A cookie is perfect for the holidays, and candies are wonderful for snacking (at least, to me). But ice cream is my favorite. But it always seems so difficult to make at home. The churning, the creme anglaise, keeping everything cold - it all can lead to a very chaotic environment and that is certainly not why I love to bake. So for starters, please read the recipe from front to back and forwards and backwards before embarking on this deliciously creamy adventure. It will make everything much less stressful and so much more fun. 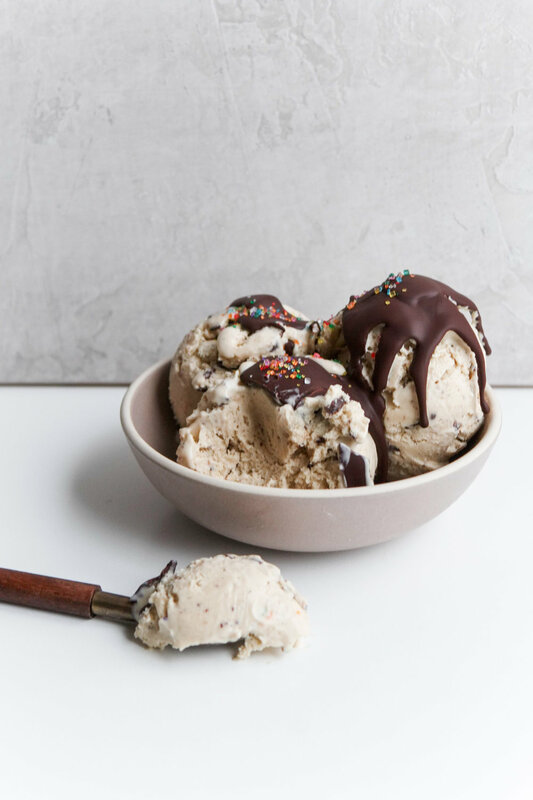 And you will be rewarded with the dreamiest dessert, and feel like a badass because you just made homemade ice cream that tastes just as good as the store. In a medium saucepot, stir together 2 cups of the heavy cream and the vanilla beans and seeds. Bring to a simmer over medium heat, then remove from the heat. Cover and set aside to infuse, 30 minutes to 1 hour. In a 12 inch ovenproof skillet, melt the butter over medium heat. Add the sugar and the water. Stir to combine. Add the bananas, gently toss them to coat, and then put the skillet in the oven. Bake until the sugar is bubbling and the bananas have softened and collapsed, 25-30 minutes, stirring halfway through. Put the banana mixture in the bowl of a food processor fitted with the metal blade and process until smooth (make sure to scrap in all of the sauce from the skillet, it’s the best). Pour the banana mixture into a medium bowl to cool. Set a fine-mesh sieve over the bowl of banana puree. In a medium bowl, whisk together the egg yolks and salt. Add the cream mixture to the yolk mixture and whisk to combine. Return the cream mixture to the pot and cook over medium-low heat, stirring constantly, until the mixture is just thick enough to coat the back of a spoon, 8 minutes. Do not let the mixture come to a boil or it will curdle - for this reason, it’s better to take it off the heat too early rather than too late. Fill a bowl larger than the bowel of puree partway with ice water. Strain the custard through the sieve set over the bowl of banana puree, discarding any solids. Whisk in the vanilla extract and remaining cup of cream. Set the bowl into the bowl of ice water. Stir occasionally until completely chilled and very thick. 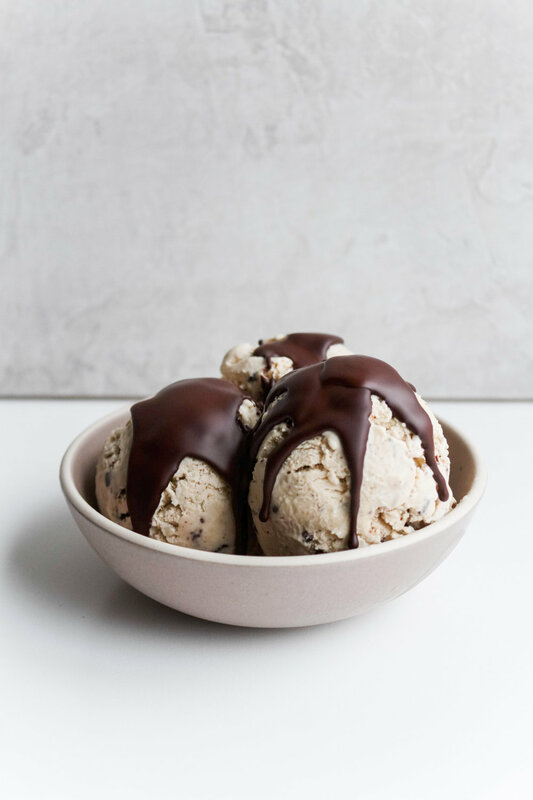 Freeze in an ice cream maker according to the manufacturer’s instructions, adding the chopped chocolate during the last minute of processing. Spoon into a freezer-proof container and freeze until firm, at least 8 hours. 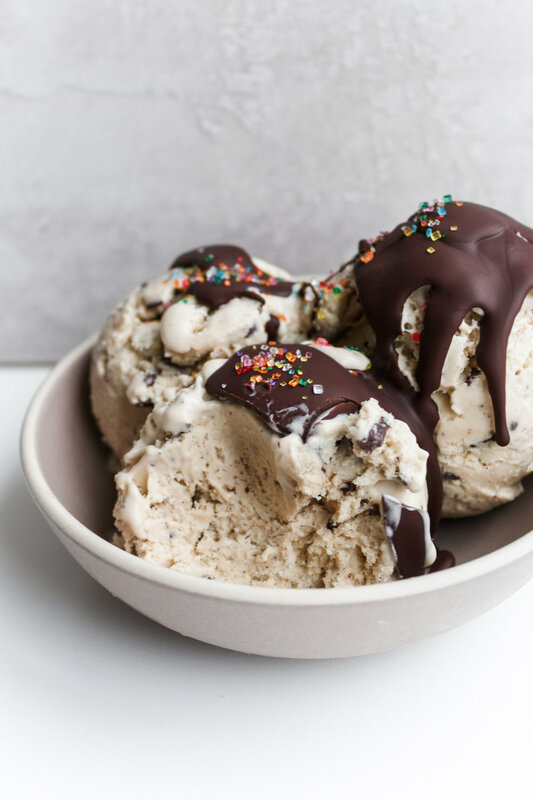 Let the ice cream sit at room temperature 10-15 minutes before serving. Store in an airtight container in the freezer for up to 2 weeks. Ice cream for all seasons! I hope you have a chance to make this. But if not - just come over. Happy January!